For over 12 years, steel fabrication has been the backbone of our business. Our Iron Workers truly are men of Steel. To give them every advantage, the Special Steel company shop is equipped with the latest in steel fabrication equipment. Our QA/QC requirements and procedures provide further assurance that Special Steel Company?s quality is the BEST in the industry. 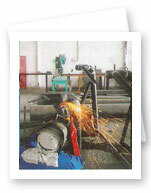 At Special Steel Company our highly skilled work force has an arsenal of tools to fabricate accurately and quickly. 2. Storage Tanks - For Fuel, Water etc. Contact us today to discuss your next project requirements. With Special Steel Company on your team, you don't just get a steel fabricator!